The SuPerLeveler™ utilizes the “dynamic crowning method” to control roll gap deviation throughout the entire steel plate, something that was not possible with conventional “preset levelers” (a method in which the amount of lateral deflection is set in accordance with the anticipated amount immediately before straightening begins). 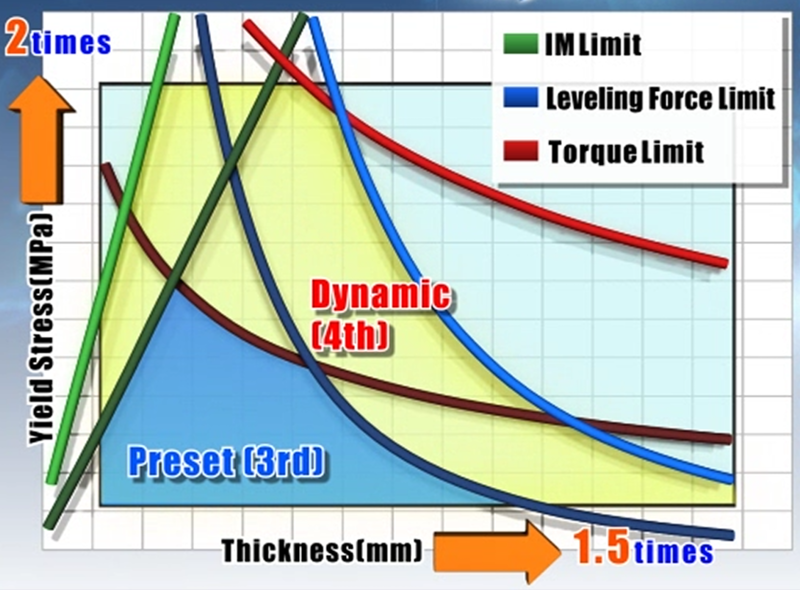 In particular, flatness is improved significantly within a range of approximately 1.2 m from the front and rear ends, compared to preset levelers. 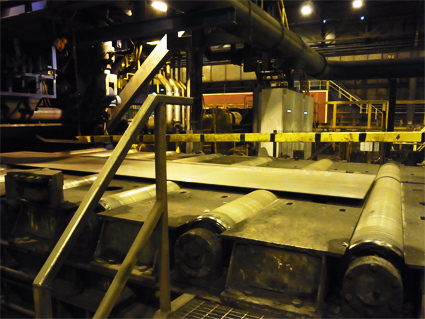 “High-load-capacity backup roll,” “bite correction control,” and other functions developed by JP Steel Plantech have significantly expanded the correctable range compared to conventional levelers. Uniform correction of areas in which the front and rear edge straightening reaction fluctuates sharply as well as constant areas has been made possible, as has the reduction of residual stress in steel plates. 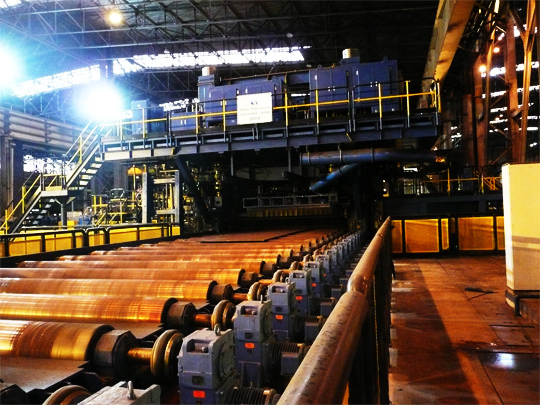 This enables the manufacturing of steel plates that do not become deformed after cutting. There are 3 types of deflection that occur in levelers: lateral deflection, vertical deflection, and compression deflection. Correction of each through a hydraulic cylinder makes it possible to maintain a constant gap between leveling rolls. 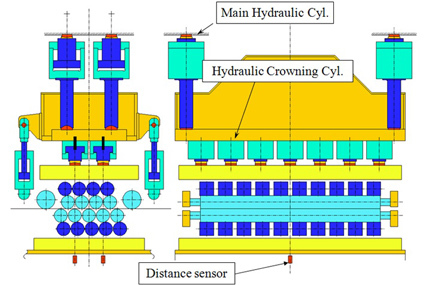 With conventional levelers in particular, lateral deflection, for which the preset type prevented changes to correction amounts during straightening, is measured with a deflection sensor installed inside the lower frame, making it possible to achieve accurate corrections with the hydraulic cylinder installed between the upper frame and the roll carriage. Because it is difficult for thin, rigid plates to feed the front edge of thick plates into the leveler, a control method called “bite correction” has been implemented to apply a light intermeshing when the leading edge is guided in, then apply the full intermeshing after that. In this case as well, a constant, fixed roll gap can be maintained in the plate’s lateral direction, even if the reactive force of the light reduction and the full reduction of the leading edge differ. 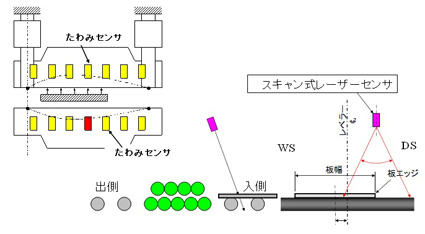 In addition to the sensors that are ordinarily used, deflection sensors are installed inside the upper and lower frames in accordance with the number of crowning cylinders, and laser sensors installed on the front surface of the leveler are used to enable off-center straightening for which the plate does not need to be centered. In the case of LP steel plates with differing lengthwise thicknesses, the straightening reaction also fluctuates, but regardless of how the reactive force changes during straightening, the SuPerLeveler™ can maintain the set roll gap, making it possible to straighten LP steel plates, and thereby significantly increasing the reliability of straightening.